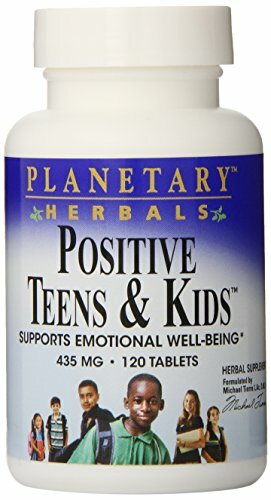 Planetary Herbals Positive Teens and Kids is a safe and natural herbal blend designed to provide deep nourishing support for the nervous system and to help maintain a happy and balanced mental outlook. Specifically designed for children and youth, Positive Teens and Kids features St. Johns wort, lemon balm, and gotu kola, key botanicals for emotional balance and mental well being. Ingredients: Proprietary Blend 870 milligrams: Gotu Kola Aerial Parts Extract, St. John’s Wort Aerial Parts Extract, Passionflower Aerial Parts Extract, Jujube Seed, Lemon Balm Aerial Parts Extract, Chamomile Flower Extract, Hawthorn Berry Extract, and Jujube Fruit Extract. Other Ingredients: silicified microcrystalline cellulose, acacia gum, stearic acid, modified cellulose gum, and silica.